Michael is a community musician, performer, and educator who has taught at Kirk’s Studio since 2011. 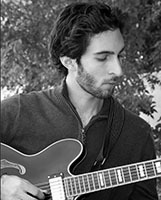 He began playing guitar when he was 14, and has a bachelor of science in communication and a master of music in music education from ASU. Throughout his life, Michael has studied and performed many styles including pop, rock, folk, jazz, classical, and Brazilian. In addition to playing guitar, he has explored forms of beatmaking and music production using Ableton Live and other digital media. Michael loves working with a variety of students at Kirk’s, and having the opportunity to see their musical and personal growth.